Welcome to Feature Friday! We have over 2000 members in the Handcrafted Soap & Cosmetic Guild and we’d like to feature every one of them. Welcome to the first of many member spotlights. Today, meet Long Family Farm! Long Family Farm was started nearly nine years ago by Judith Long, whose addiction to soapmaking started after teaching a 4-H soapmaking class. Shortly after that first class, the Long Family was exclusively using Judith’s creations and 5 years later, Long Family Farm offered its wares to the world. 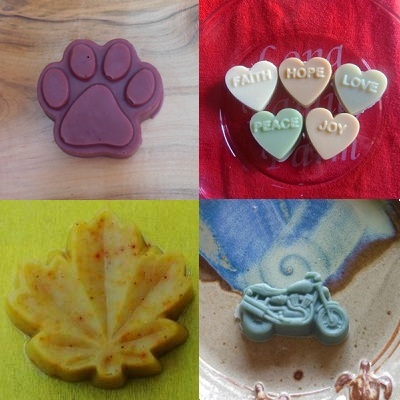 Today, you’ll find them online at www.LongFamilyFarmSoaps.com and on Facebook at https://www.facebook.com/LongFamilyFarm. You can also find Long Family Farm Soaps in several North Carolina locations as well as stores local to the Winston-Salem area. Long Family Farm returns the local support, displaying their soap on local artists’ work, a small glimpse of which you can see in the motorcycle soap picture above. When you’re in the shop, check out the facial soap. Developed to tackle problematic teenage skin, it’s become a best seller. While you’re browsing the shop, you may stumble across the ‘Educate Yourself’ page. Education is a passion for Long Family Farm. Judith spent a huge amount of time researching the ingredients she puts into Long Family Farm Soaps and in turns, shares information with consumers through her website. If you’ve ever wondered what fresh goat milk is doing in your soap or why you might use illipe butter, check out the Long Family Farm Soap education page. About the Guild, Judith says, “If life ever slows down, I want to be certified.” We’re ready to support you with that goal and add you to the ranks of our certified soapmakers, Judith! Keep up with the Long Family Farm’s latest happenings on their Facebook page and keep bath time fun for everyone. Thanks, Judith, for sharing your story!